Language and Materiality integrates linguistic anthropological and sociolinguistic scholarship on a range of topics: semiotic approaches to language, language commodification, sound, embodiment, mediatization, and aesthetics. Empirically rigorous, the volume engages scholars and students interested in language, its use, and meanings. It consists of three sections - 'Texts, Objects, Mediality', 'Sound, Aesthetics, Embodiment', and 'Time, Place, Circulation' - containing chapters and short commentaries, framed by a curated conversation about semiotics and materiality in anthropology. 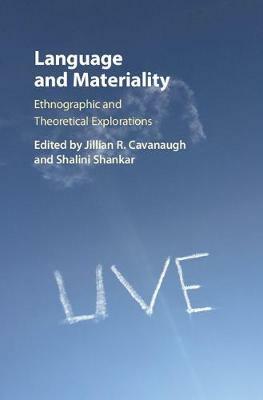 Each section theorizes intersections, connections, and relationships between language and materiality across diverse topics and ethnographic contexts. The volume shows that materiality may be approached as a feature of political economy, sensual experience, aesthetics, and affective relationships in its relation to language as talk, register, genre, ideology, and acoustic object. It consists of new perspectives on materiality as a vital dimension of social life and signification in global capitalism, connecting inquiries on subjects as diverse as food, media, fonts, and music.